Echelon focuses on analyzing and optimizing every contract deal to maximize profits and cut costs. Our clients have consistently achieved ROI results over 10x, with many results far surpassing that multiplier. 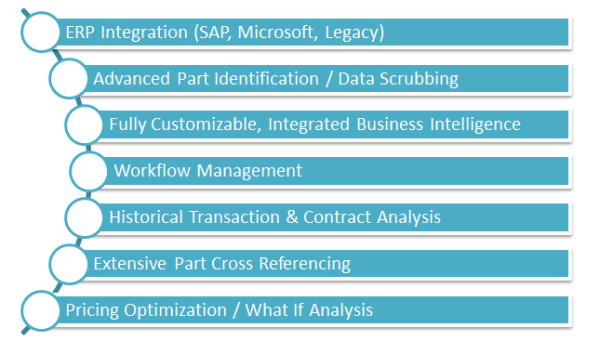 Echelon's architecture is built on a Business Intelligence platform that is both expandable and customizable. Not only does Echelon have best of breed analysis capabilities, it can be customized to fit your enterprise more easily, precisely and at far less cost than any of the competition. Studies have definitively shown that business intelligence solutions are frequently under-utilized due to poor integration with normal business processes. Echelon creates new process workflows that integrate pricing optimization into every RFP response, ensuring maximum benefits. Echelon offloads large analysis tasks to the Echelon server. This improves analysis turnaround greatly, while keeping your workstations responsive and available for use. All aspects of maximizing performance have been a primary goal throughout the evolution of Echelon. More time for your staff's analysis and productivity and less time waiting and needlessly clicking keeps morale high and results positive.